Derry City manager Kenny Shiels has confirmed he has talked with Northern Ireland international Paddy McCourt. The 32-year-old is returning home after leaving League Two side Luton Town by mutual consent and a return to the Brandywell is on the cards. Town’s manager Nathan Jones recently confirmed the ex-Celtic winger will be returning home. “Paddy has had to face up to some personal problems in recent weeks,” said Jones. “At the end of the season he came to me and it was soon clear that he wanted to return to Northern Ireland to be closer to his family and to play there again. 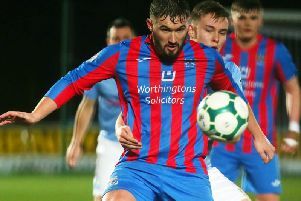 Since that announcement Shiels and a host of other clubs such as Linfield and St Patrick’s Athletic to name but two, have looked to add McCourt to their squad. Shiels spoke to Kevin McLaughlin after training this afternoon.